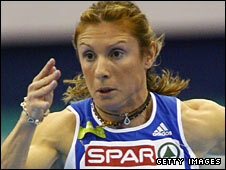 Controversial sprinter Katerina Thanou has been named in Greece's provisional squad for the Beijing Olympics. Thanou got Greece's B qualifying time for the 100m when she finished fifth in Crete on Monday in 11.39 seconds. The B time is the lower qualification mark and if her time is beaten, Thanou, 33, would be forced out of the team. An Olympics appearance would be controversial as Thanou and compatriot Kostas Kenteris both missed drugs tests on the eve of the Athens Olympics. "Officially, she has now made the team but we do not yet know if she wants to go to Beijing," an official from the Hellenic Olympic Committee said. The story of Thanou and Kenteris's missed drug tests overshadowed the opening of the 2004 Games. It was the third time they had missed tests, resulting in a two-year suspension that expired at the end of 2006. The pair still face criminal charges of perjury and falsifying evidence in Greece after claiming they had been injured in a motorcycle crash on the eve of the Games. Thanou won silver behind Marion Jones at the 2000 Sydney Olympics and is fighting to be awarded the gold, following the American sprinter's disclosure last year that she had been taking the banned steroid THG at the time.